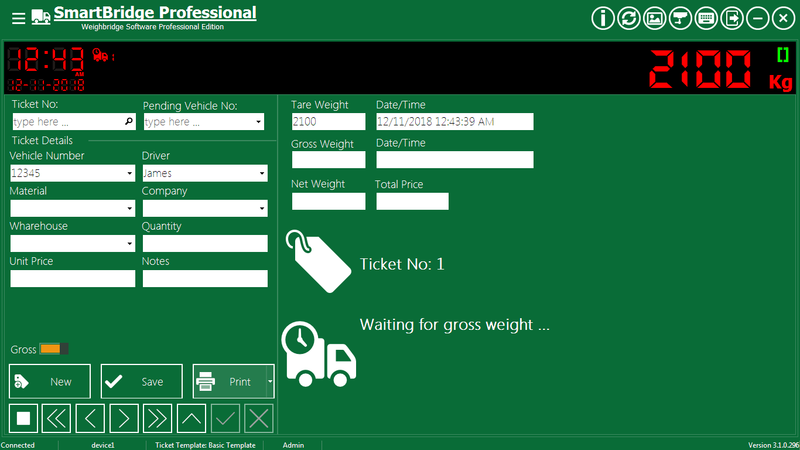 SmartBridge is an easy to use Windows based Weighbridge software with multilingual user interface. SmartBridge can connect/operate with any weight device/indicator. It’s highly configurable software. There are many options and settings that you can adjust to make this application suitable for your business. -	Multi language user interface, currently application available in (English, Arabic, Portuguese, Indonesian). User can select/change application language during the installation or at runtime. -	Easy to install, small size installer and no need for any external frameworks or tools. -	Easy and clear way to connect to the weight device/indicator. -	Multi device support, you can add unlimited number of weight devices/indicators and switch between them easily at runtime. - The ability to display the weight value from two devices/sources at the same time using dual display (Professional edition only). -	Connect and work with any weight device/indicator. - The ability to work over local network (Professional edition only), you can choose to install Client/Server/Standalone version from one installation package. - Network access using embedded Http Server (in Professional edition only). 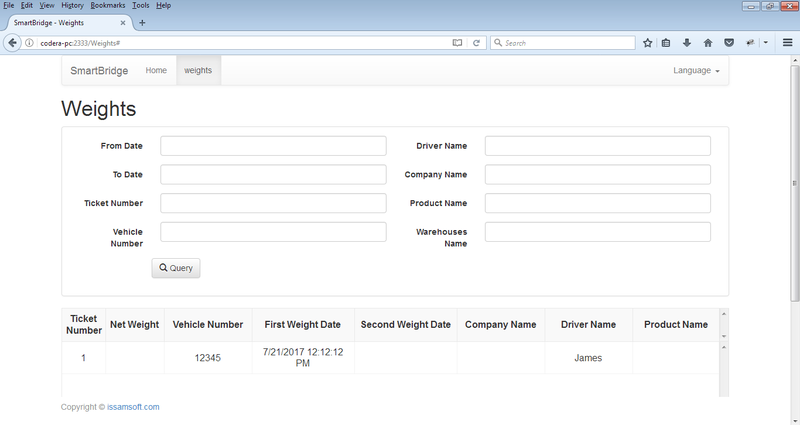 - Up to 16 custom/backup fields and ability to show/hide/reorder all fields in the Operation screen. - The ability to control external (Open/Close) USB relay devices (in Professional edition only). - Support working with external Scoreboards devices (in Professional edition only). 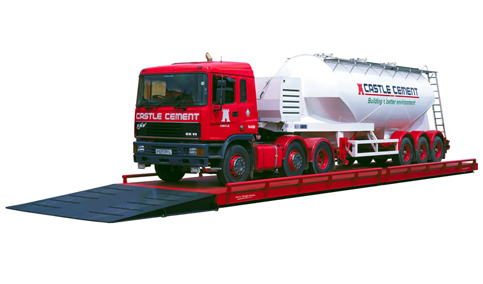 - The ability to receive the weight value from three different sources: Weight Indicator, PLC, Another PC. (Professional edition only). -	Support touch screens with on-screen keyboard and touch screen gestures. - External utility to import data from other applications. -	Embedded algorithm to protect from negative or unstable weight values. 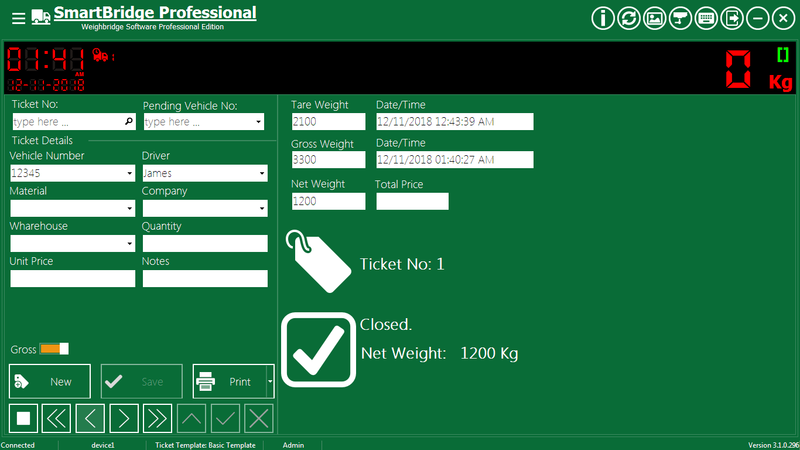 -	You can design print template for the weight ticket, you can add and work with unlimited number of print templates, and you can switch between print templates easily at runtime. - External utility to design professional ticket templates. -	Support multi users, roles. -	Highly configurable software, it has many settings/options that you can adjust to make SmartBridge suitable for your business. -	Easy database management, you can make database backup, restore database, or create a new database easily. 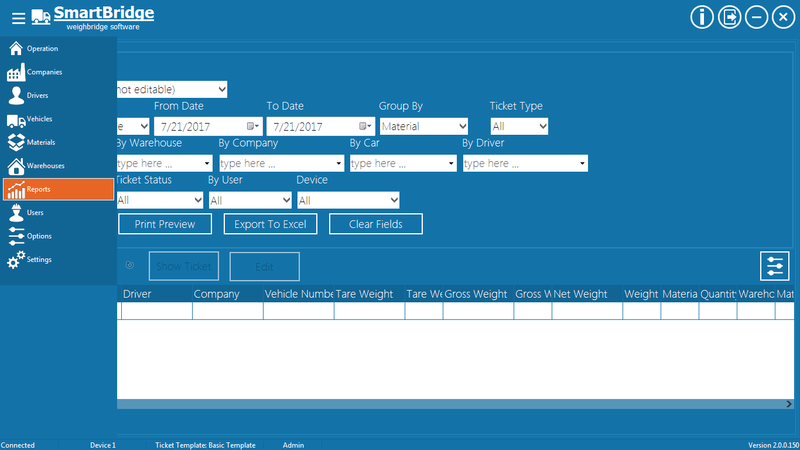 -	You can clear the ticket table and reset the ticket numbering without losing other data such as drivers, vehicle numbers...etc. -	Highly configurable search and work report. -	Export data in Excel, pdf format. 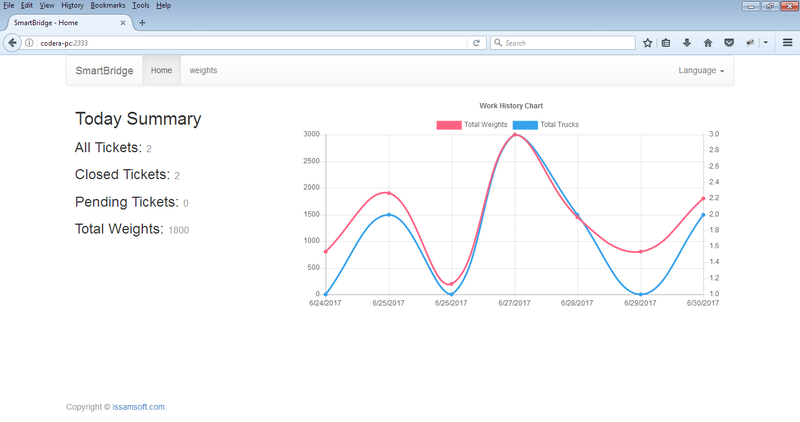 What’s new in version 3.x? -	Full support to work over local network (in Professional edition only) you can choose to install Client/Server/Standalone version from one installation package. -	The application is available now with a new Portuguese, Indonesian language interfaces. -	Added support for custom fields and show/hide/reorder the fields in the Operation screen. - Added support for working with external USB relay devices (in Professional edition only). 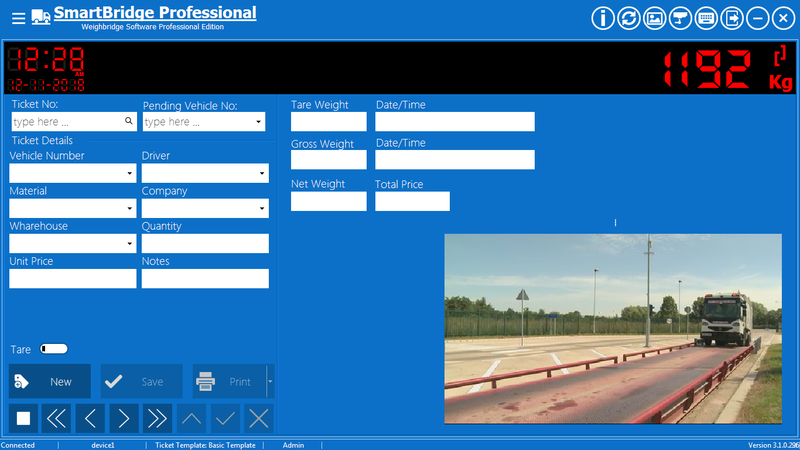 -	Added support for CCTV/Cameras (in Professional edition only). - Added support for working with external Scoreboards devices (in Professional edition only). - The ability to share/transmit the weight value over network, this will let you use multiple computers to work with one weight device/indicator (Professional edition only). - The ability to display the weight value from two devices/sources at the same time using dual display. - The ability to schedule the database backup. 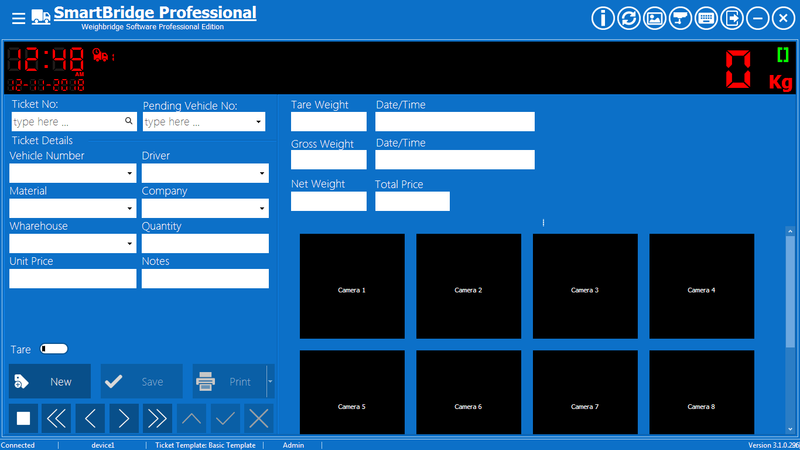 - Added support for weight discount. 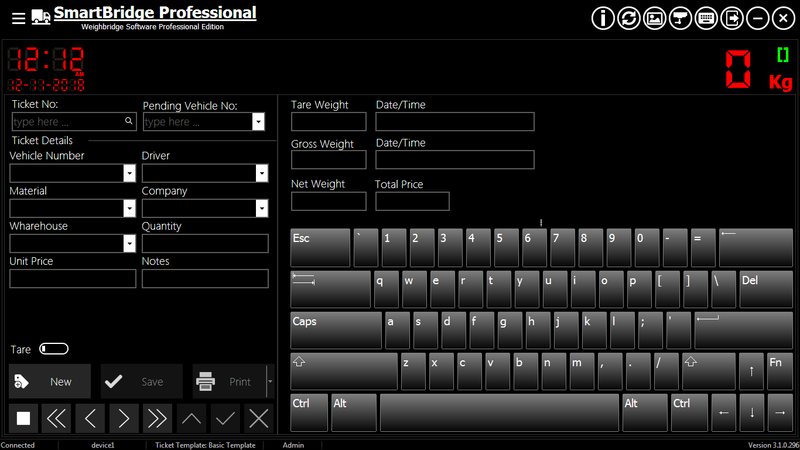 -	Added option to auto detects Tare/Gross weights. -	Added full support for touch screens with on-screen keyboard and touch screen gestures. 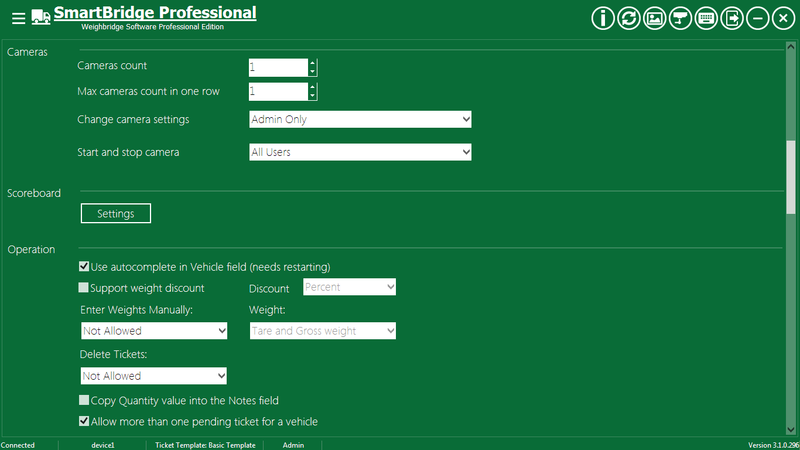 -	New external utility to design professional ticket templates. -	Other minor changes and enhancements. Supported operating systems: All Windows starting from WindowsXP and newer (32/64 bits), professional edition requires Windows 7 or newer (32/64 bits). -	Computer with serial port (COM port) to connect the scale device/indicator. -	Monitor with at least (1024X768 pixel), using less resolution will cause some parts of the application to disappear. You can also watch some tutorials on our our youtube channel in English , or Arabic. In is video we explain how to install SmartBridge. Our customers can contact us using email, Skype, Whatsapp. We can also give remote technical support using TeamViewer service.